We have a large swimming pool for fitness swims and zero impact hydrotherapy treatments as well as an aquatic treadmill for rehabilitation. Each session will last approximately 40 minutes. Dogs will have a health check and will be showered prior to each swim. They will be fitted with a life jacket or harness for their swim and then showered and dried after each session. A record will be kept of each individual dog's progress. There is a toilet facility in the building and plenty of seating throughout the centre. A fitness/fun swim great for maintaining your dog's fitness or introducing your dog to water in a safe and clean environment without the dangers that lakes and rivers can offer. 10 Swim or Treadmill sessions tailored around your dog's condition. 10 fitness/fun swims great for maintaining your dog's fitness or introducing your dog to water in a safe and clean environment without the dangers that lakes and rivers can offer. Whilst every care is taken of the dogs undergoing treatment and in the maintenance of the water and equipment, all dogs receive hydrotherapy treatment entirely at their owners' risk. Dogs will not be treated without the prior authorisation of their veterinary surgeon. Dogs with infectious or contagious conditions, such as ear, eye or skin infections, gastric upset, kennel cough and so on will not be treated. Owners are advised to cancel all appointments with at least 24 hours notice, until the condition is clear. Normal cancellation conditions will apply. When visiting Fit Paws Hydrotherapy Centre you are advised to wear sensible shoes and clothing. The pool and Treadmill room can become very wet during your dog's swimming session and the floor may become very slippery. Fit Paws Hydrotherapy Centre cannot be held responsible for any loss or injury to any person or animal, howsoever occasioned, whilst on company premises. Fit Paws Hydrotherapy Centre cannot be held responsible for any loss or damage to vehicles or personal property, howsoever occasioned, whilst on company premises. When not undergoing treatment all dogs must be kept under control and must be on a lead at all times both in and out of the pool room. Dogs unable to walk without assistance are not required to be kept on a lead. We reserve the right to cancel any appointments after such an incident as a dog defecating in the pool or a power cut (for example). This is purely for health and safety reasons, as we do not want to risk the safety of any animal/owner. For these reasons please make sure we have a mobile contact. Owners are requested not to feed their dogs for at least 3 hours before attending an appointment, and to ensure the dog has emptied its bowels before arriving. A charge of £30.00 will be made for dogs that defecate in the pool (as we may have to close the pool in order to remove it, and clean the pool). 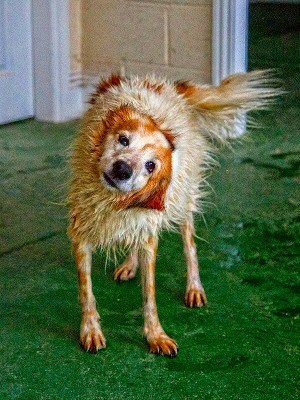 We also advise not to feed your dog for approximately 1 hour after swimming. Fit Paws Hydrotherapy Centre reserves the right to use video footage and photographic stills taken during sessions. It is the owner's responsibility to poop-a-scoop after their dogs, whilst on company premises and its surrounding environment. 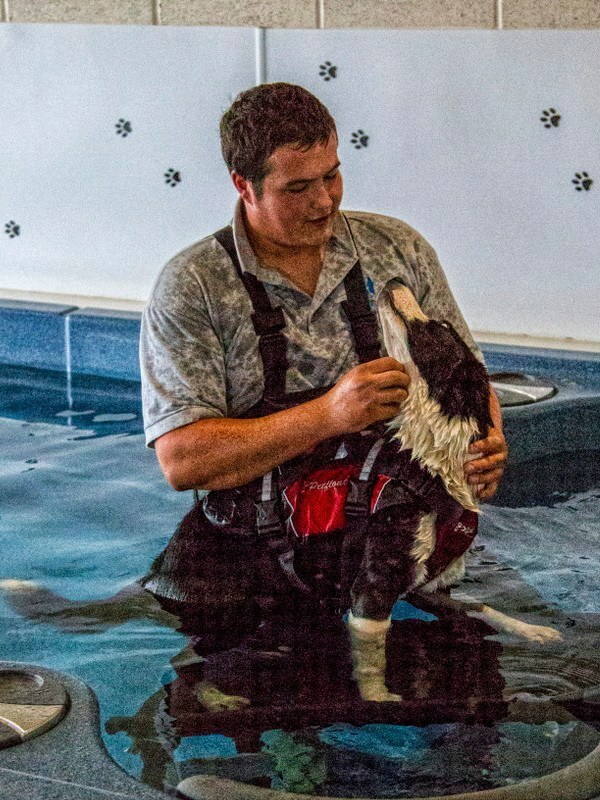 Owners are required to notify Fit Paws Hydrotherapy Centre if, during a course of treatment, the dog's injury or condition worsens, or if the veterinary surgeon advises that the treatment is stopped or suspended. Fit Paws Hydrotherapy Centre reserves the right to refuse treatment to any dog. All treatment, including sessions being part of an insurance claim, must be paid for on the day of treatment. Session fees will be charged in full if an appointment is missed or cancelled without 24 hours notice. Fit Paws Hydrotherapy Centre will require sight of the vaccination certificate or equivalent prior to commencement of treatment. It is the owners responsibility to ensure that dogs are brought for their treatment in as clean a condition as is possible. Our Centre is not the ideal environment for young children. Should it be necessary for owners to bring children, in the interests of health and safety they must remain with the accompanying adult at all times whilst on the premises.